I'm babysitting my friend's 2 year old nephew and he's fast asleep in his stroller. I put on Treehouse (The Wiggles right now, waiting for the Backyardigans aka my favourite kids show....that I sometimes watch....by myself...) so that if he wakes up it might distract him and keep him from crying for his auntie. Oh my gosh he's cute. John and I have/had all these big plans for him: we were going to make a pizza (I bought the dough, sauce, pepperoni) and take him swimming but my friend said there's a very real chance that he might nap straight through to 7:30 when he gets picked up. Anyway - it's Wednesday! You know what that means. Today I though that since I've covered an ornament (the button one), wreaths, and gingerbread cookies, I'd pick a centerpeice option for this weeks entry. I think next week will be back to baking. 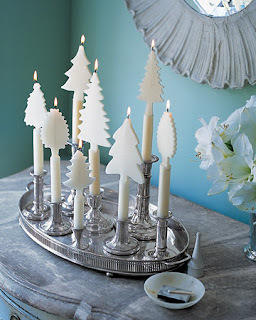 Today is Tree-Shaped Candles! Or any shaped candles, really. I've wanted to make candles before but had trouble finding the stuff necessary. Click on the link above to get the instructions. There's also a visual guide which is very helpful! I've decided that come December 1st I am going to try and blog EVERYDAY until the 25th. It'll be my insane Christmas Countdown. My blog-vent calendar (like advent....get it?). I'll try and do a lot of recipes and maybe put up my attempts at the crafts I've been suggesting during these Christmas Wednesdays! Well, I'm off to ogle an adorable sleeping child for a few hours. Christmas Wednesday - Week 5: Carol Quiz! Christmas - 44 days away!